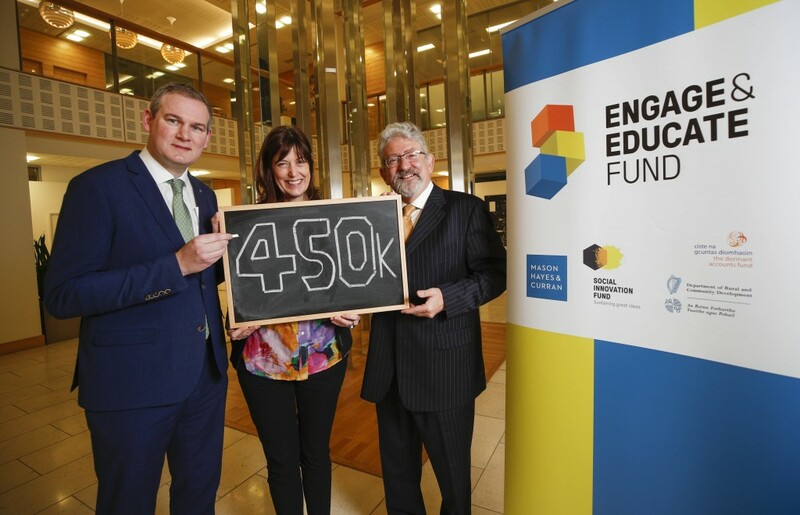 Law firm Mason Hayes & Curran and Social Innovation Fund Ireland, with Minister of State for Community Development, Natural Resources and Digital Development Seán Kyne T.D, today launched the second year of their €450,000 Engage & Educate Fund. Following a successful first year, €150,000 in funding will be available to be shared between the 2018 Engage & Educate awardees. The deadline for applications is 16th March 2018. The fund will support community projects that empower people through education to achieve their full potential and to contribute to their communities. Projects that focus on people experiencing disadvantage, people with disabilities or migrants are encouraged to apply. The fund is a ground-breaking three-year commitment between Mason Hayes & Curran, Social Innovation Fund Ireland and the Irish Government. Successful projects will receive a share of the significant fund including a cash grant and access to an Accelerator programme which provides supports similar to those provided by venture capital companies to commercial enterprises. Non-profit organisations, educational institutions and community groups across Ireland are encouraged to apply for funding by Friday 16 March 2018. Speaking about the importance of education to the firm’s CSR policy, Richard Woulfe, Partner, Mason Hayes & Curran said “Mason Hayes & Curran have supported the provision of educational opportunity, particularly for disadvantaged people, for many years. We strongly believe in the individual and societal advantage that educational opportunity can bring and that’s why we have such a long standing commitment and focus on the issue. Deirdre Mortell, CEO of Social Innovation Fund Ireland, added “Engage & Educate has enabled 397 students to gain extra skills, with measurable educational impact. For example 90% of Intercultural Language Service’s adult learners have improved their English enough to work and participate in social life in just a few months. Additionally, ILS has opened a new centre in Marrowbone Lane, Dublin 8, expanding its reach to a whole new community. The 4 Engage and Educate awardees have together raised €180,000 in follow on funding since July 2017. Following on from the success of the first year of the Engage & Educate Fund, we are really pleased to call for applicants for the second year of the fund, providing supports to innovative educational initiatives that allow people to achieve their full potential”.